BACKGROUND: Orange hawkweed is native to Europe. Distribution of this weed has likely been assisted by flower enthusiasts due to its beauty. Orange hawkweed spreads by seeds, stolons, and rhizomes, and generally inhabits moist grasslands. DESCRIPTION: Orange hawkweed is a perennial weed with shallow, fibrous roots. Leaves are hairy, spatula shaped, up to 5 inches long, and almost always basal. Extensive stolons create a dense mat of hawkweed plants that practically eliminates other vegetation. Stems are usually leafless, although occasionally a small leaf appears near the midpoint. Stems may reach a height of 1 foot and bear up to 30, 1/2-inch flower heads near the top. Flowers are red to orange and appear in late May or June. Stems and leaves exude a milky latex when cut or broken. Seeds are tiny and plumed. 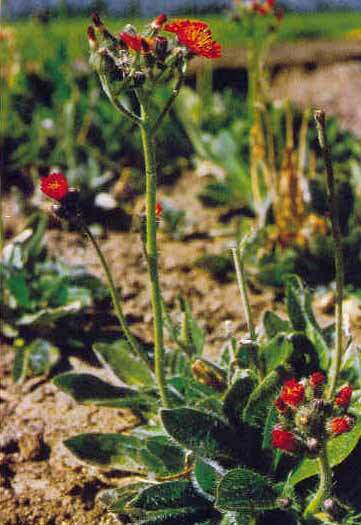 DISTRIBUTION: Orange hawkweed is found in many eastern states and also from western Washington to Wyoming. CONTROL: No biological control agents are available for orange hawkweed. When selective herbicides are applied in the spring and followed with nitrogen fertilizer, grass competition can keep this weed suppressed.